NEED ANSWERS TO YOUR DOWNLOAD QUESTIONS? RUN TIME IS: 1 HOUR & 40 MINUTES! 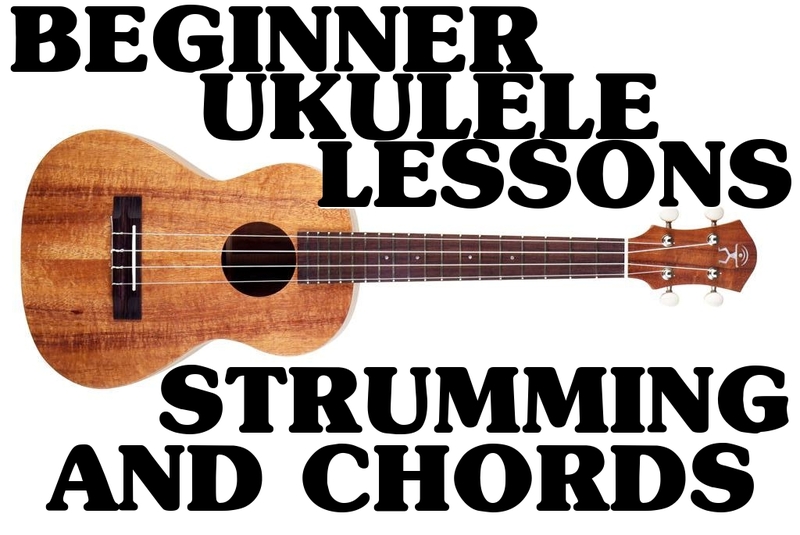 BEGINNER UKULELE LESSONS STRUMMING AND CHORDS ! After putting out my last Ukulele lesson, a lady named Esther wrote me and asked if I would do another Ukulele lesson and concentrate pretty much on just showing all of the different strumming patterns for the Ukulele. So, I said sure, why not. (I do groovy things like that). So, in this lesson, I'm taking care of her request to do just that. I cover so many strumming styles that it will make your head swim. I also cover finger picking styles. I went a step further and made sure to show the very beginner how to play the standard chords too and to tell them how to play songs on their own. So, here you go, if you've never touched this instrument in your life, I'll have you playing like a pro at the end of this video. Again, check out the video clip to see what you are getting yourself into. So easy a child could do it. Seriously....if you can't learn, keep the video and I'll give you your money back too! 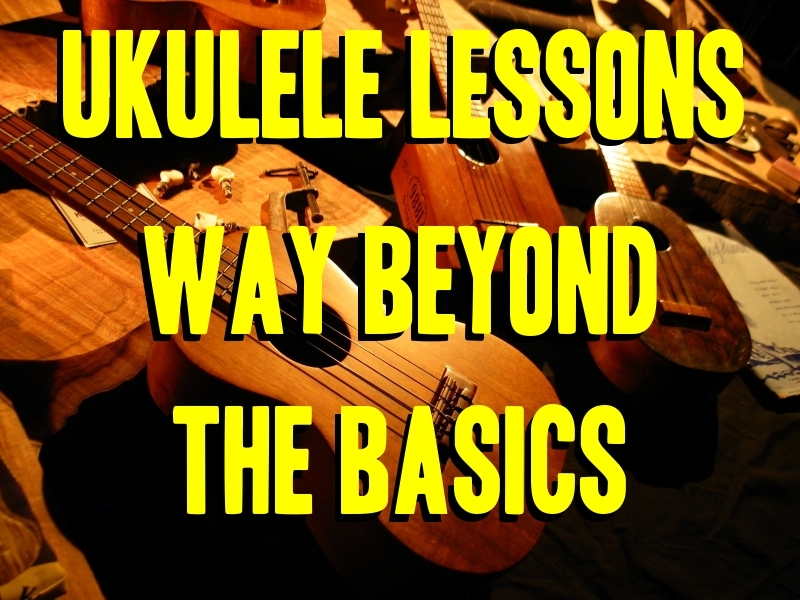 UKULELE LESSONS, WAY BEYOND THE BASICS. Be The Best Uke Player EVER! RUN TIME IS: 2 HOURS! This video lesson is going to flat out kick you into a MAJOR ukulele playing machine! Sure, all of the years of TRADITIONAL uke playing are honored and respected here, but that's where this lesson makes you take off like a rocket. If you were a guitarist, I can honestly tell you that this single lesson can take you from the guy playing at the Holiday Inn to the level of Jimi Hendrix in almost no time at all. All I expect from you in the beginning is that you already know how to tune up and play a couple of chords and I've got you from there on out. You could even grab my "THE WORLD'S BEST UKULELE LESSONS" for guitarists, which I did because guitar terms and techniques transfer to the uke SOOOOO amazingly. So, once you finish this lesson, grab that other one....I know you will be able to handle it. That will take you to a place that will simply blow people's minds. Enjoy this lesson. HONESTLY, your playing will AMAZE people after it! THE WORLD'S BEST UKULELE LESSONS ! The World's Best Ukulele Lessons ! (For Guitar Players). OK Skippy, here's what is in this lesson (better yet, just play the video below and it will show you what's going to invade your little brain....lol). 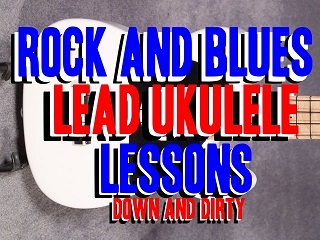 I'm teaching you all of the traditional Ukulele chords, all of the variations of those chords and all of the different notes you can add to each chord to make it MUCH more interesting than the traditional style chords. There's nothing wrong with the traditional Ukulele style, but I'm here to take it to a level that you never thought of or even thought possible with a Ukulele. I approach this from a guitarist's point of view and will especially make a guitarist a great Uke player in hours instead of months or years. That's right. If it takes you more than a week or two to play a Ukulele, then you need to fire your teacher. There is no reason not to master this thing quickly. I teach you the standard Hawaiian style of playing (no songs taught) those can be learned anywhere on the internet. Just hit You Tube and you can learn to play any song. If you want to learn to play the Ukulele and play it beyond average, then you've come to the right place. I honestly take this thing further than most dare to push it. There are great classical Uke players out there (not taking a thing away from them....they are masters and deserve their praise). But, I'm here to slay this thing and frankly kick it's booty into a whole new way of playing that you'll simply be amazed that a Ukulele is capable of doing all of this. OK, enough with my yacking, play the video clip and you'll see what I mean. If you've never touched a Uke before, that's fine, I'll get you there. If you're a guitarist looking to play the Ukulele, you are in for a major blast of fun! ROCK AND BLUES LEAD UKULELE LESSONS. It was just a matter of time for this lesson. Ukuleles have long been thought of as not much more than a toy by most people and the weapon of choice by others. The time has simply come for the ukulele to take its place in the spotlight where a lead guitarist would be. All of those same licks and sounds can be had from today's instruments, so the uke can now contend with the biggest, loudest and craziest bands around. I've even seen a couple of ukes with built in flame throwers! So, I'll teach you all the stuff you'll need to start taking on the world and changing the way they think about the ukulele. The UKE (like a guitar) can be soft or plug one in and turn it up to 10 and blow people's minds. The "Eddie Van Halen" of the Ukulele is out there somewhere and it won't be long before that person is going to show up on the big stages. You might as well take the job......it's right there waiting on you. Once someone holds that COOL position, everybody else will just be a clone or follower. LEAD THE WAY!